UPDATE: We managed to take photos of Samsung's 5G demo phone from all sides. 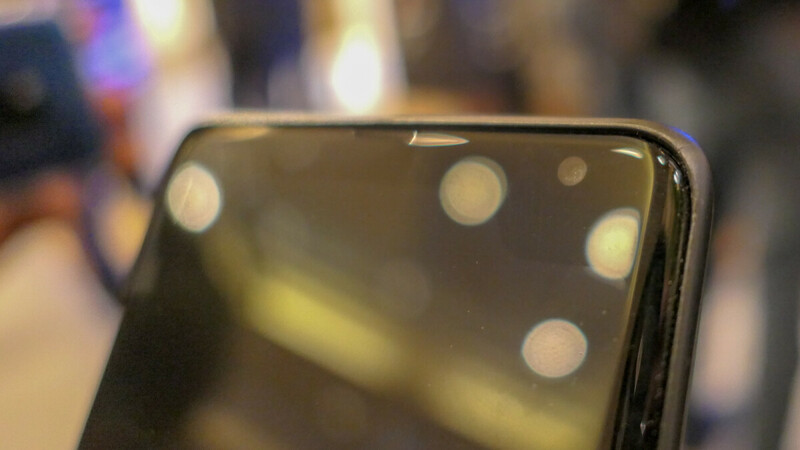 In the gallery below, you may see not only the unusual shape of the notch, but also the back of the device with a mysterious "10" sticker on it. Coincidence? We'll probably find out next year. Original story follows below. Earlier today, Qualcomm kicked off its annual Snapdragon Summit in Hawaii. It confirmed the Snapdragon 855’s existence – in-depth details will follow tomorrow – but focused mainly on 5G today. Predictably, Qualcomm was joined on stage by executives from a number of global carriers as well as other partners. Among this second group was Samsung who made the most of the opportunity by showing off its 5G demo phone. At first, this device looks like any other regular one but, upon closer inspection, a pretty weird notch can be seen in the top right-hand corner. The reason for this notch remains unclear at the moment – Samsung itself hasn’t provided any details on the matter – but there is a chance it may have something to do with the Galaxy S10. From what can be seen in the images of the device (which is roughly the size of a Galaxy Note 9) the display notch in the corner appears to be totally useless from a hardware point of view – the top and bottom bezels are already pretty thick and the front-facing camera isn’t placed within it. But from the software side of things, it could be pretty useful. See, as recent renders revealed, the larger Galaxy S10+ should include a pill-shaped display hole in the exact positioning of this particular notch. This means that Samsung’s software will need to be adapted to the design feature before any kind of release happens. And this exact demo phone could be a way of testing that before moving onto more advanced designs, thus suggesting that it could be a very early prototype of the Galaxy S10+. Until Samsung itself confirms or denies this theory, it remains pure speculation. But it's worth noting that Samsung itself pointed out that this smartphone is nowhere near the final hardware and that it "can only get better." People in 18th century: "There's a hole in my boot." People in 21st century: "There's a hole in my phone." Samsung is finally caving in and stooping to the level of Apple. What a bloody shame, eh? Does an ~8mm bezel really makes a phone bulky? If you think so then you deserve a good spanking... Oh well, G'Day! Calm down, it's just demo model, they didn't even sell this phone. Samsung plz kill meeeeeeeee........ I'd rather die than seeing an actual phone with this horrendous design. Samsung dont do that. That will be the stupidest thing ever. Samsung makes it so much easier for Huawei to surpass them in sales. Radical design for just a demo phone. Well, if you look closely at the pics, you will see that the camera is NOT in a notch. The top edge of the screen is clearly noticeable just under the camera. Then again, without the screen being on, it is difficult to tell exactly what the screen is like. Hilarious to read the article that assumed the pictured device off has a notch without taking a close look. Note 9 and S9/S9 Plus have similar front camera hole. The unit seems like a prototype or a mule test. Hopefully the author will be kind to correct the mistake.